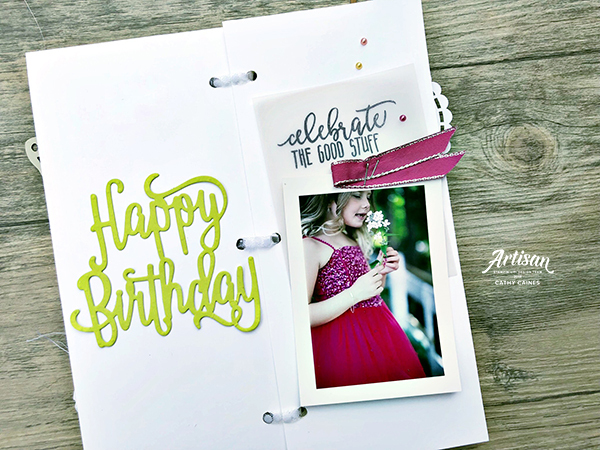 Let’s Celebrate You Mini Book by Stampin’ Up! And I am excited to see what this year brings. But I just want to freeze time so that I never forget what 7 brought. That’s where mini books help. Hello everyone, Cathy Caines here today on the Creative Srapbooker Magazine blog. Today I am celebrating her turning 8. So let’s do this. I never over think mini books. In order to start, I make some decisions about the cover. That was easy for me – Stampin’ Up!’s Share What You Love Designer Series Paper with the polka dots catches my eye every time I create a fun project. A bit of machine sewing around the edges gives the cover that finished look I am looking for. If you are eyeing the beautiful butterfly and floral die cuts on the cover, these are from a new Stampin’ Up! product called Springtime Impressions Thinlet Dies. I always have several of these cut and laid on the side of my desk in my “die cut” box. These dies have the ability to soften busy patterns such as this. Once I am ready to start building pages, I find my pictures first. I actually put a dab of glue on each picture and glue them in place. It’s not too much glue where you couldn’t rip it off if you changed your mind later. Now I have a basic mini book. All that’s left is to embellish. For this project, because the pictures I selected are fun and bold I used the Broadway Bound Specialty Designer Series Paper. I simply grabbed my scraps and tucked them in here and there. Gluing as I go. I do multiple pages at a time – meaning I haven’t finished the first page before I am tucking and gluing patterned paper into the next. Once I finish up with the patterned paper, I add trims like the Berry Burst Metallic Trim. I staple and look for spaces that need to be filled. I flip back and forth until I run out of time and I am happy with it. Thank you so much for hanging out with me today. And now it’s about time that I wrap up her very special present. A trip to Toronto to see Taylor Swift. Her first concert is probably a pretty fun way to kick of 8, don’t you say? If you are admiring those pictures, photo credit goes to White Willow Photography by April Maxine Stead. And yes. She’s amazing. My family is lucky to have her. Thanks for dropping by to check out my project today – have a wonderful day! If you are interested in Stampin’ Up!, are living in Canada and don’t have a demonstrator, I’d love help you out. Feel free to drop me a line to get a catalogue or if you have any questions/comments you can always find me at inthecatcave@hotmail.com.